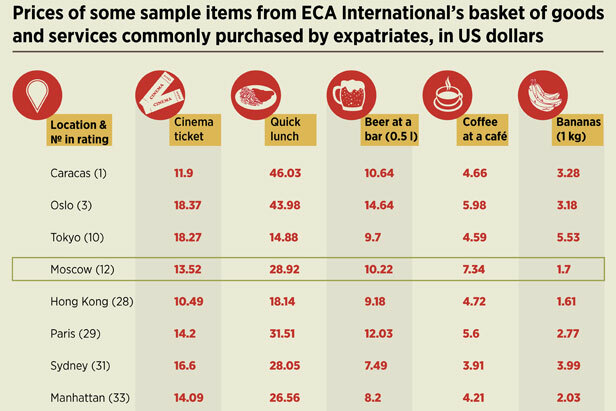 Consulting company ECA International has evaluated the daily expenses of foreigners living and working in different countries around the world. Experts have estimated the standard package of goods and services, considering prices for food, clothing and electronic devices, costs for moving around the city, food in public places and entertainment. In Caracas, for instance, lunches are more expensive than anywhere else: an afternoon snack will cost an average of $46. Those who want to cook at home will have to buy some expensive eggs: the price for a dozen eggs is one of the highest – a little more than $7. Moscow ranks 12th place of the list, and its cups of coffee are the most expensive at nearly $7.5. Compared with other countries, Moscow beer is quite expensive - more than $10 for half a liter. But the highest price for a drink is in Oslo. In many ways, Moscow is similar to New York City in terms of the level of prices for products and goods, although the American city occupies only 33rd place in the rating. The rating includes 440 cities in total. One of the most profitable cities for employers is Dubai at 171st place in the rating and Abu Dhabi at 181st place. You’ll find the cheapest gasoline there at $0.48 per liter, and soft drinks at $0.66.